Inclusive. Sacramental. Independent. Catholic. Christian. It is not surprising that crosses are a common sight in Jerusalem. 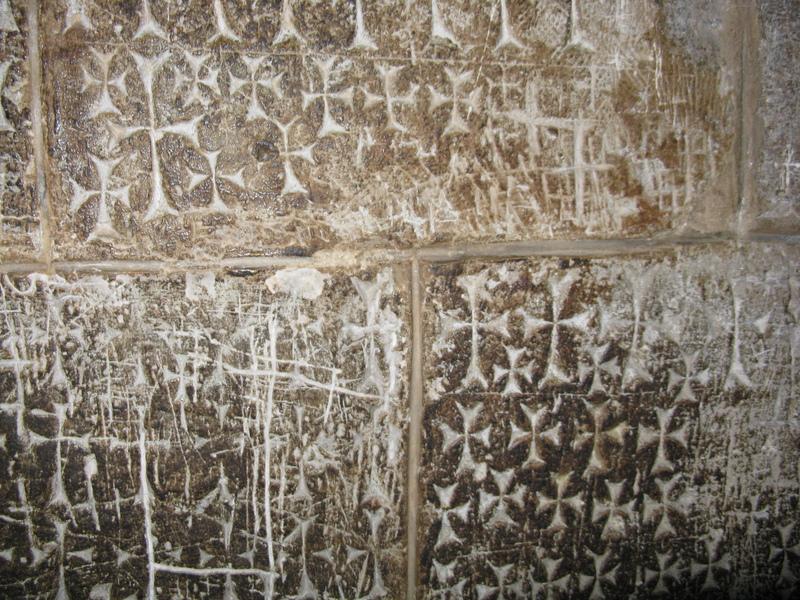 Not only do they decorate churches, but tourists as far back as the Crusaders have scratched them on the walls. Smaller wooden and metal ones by the thousands are on sale in shops. There are even a large number of full-sized wooden crosses that can be found leaning against the stone walls that line the Way of the Cross, the Via Dolorosa. Christian pilgrims are drawn to Jerusalem and Israel from all over the world. They want to see where Jesus lived and preached, to walk where he walked, and to be where he was crucified and resurrected. Some are content to observe and pray, but others want to enter more actively into their Holy Land experience. So they pick up one of these life-sized crosses and carry it for a distance up and down the steep streets of the city. Sometimes they carry it the full length of the Via Dolorosa, putting the cross down only when they get to the Church of the Holy Sepulchre. It’s an interesting sight watching one of these people choose a cross to carry. They look over the available crosses, pick one up, heft it—and then possibly put it down again and pick up another that is more to their liking. This doesn’t reflect badly on their devotion; it is often a realistic acknowledgment of their own limitations. Jesus, though, did not pick his own cross. The Roman soldiers forced him to carry one of their choosing on the torn flesh of his back. They then marched him and other condemned men through the streets in a public display of the consequences of defying Roman law. But in the pain and shame, this was also the path of redemption for a broken and fallen world and for a hurting humanity. Pray that there may be redemption in the brokenness of our world and our selves. Pray for the peace of Jerusalem.